MARINE FORECAST FOR THE BAHAMAS FOR 24 HOURS FROM 6AM MONDAY 22ND APRIL 2019, ISSUED BY THE BAHAMAS DEPARTMENT OF METEOROLOGY AT 0930UTC. BEACHGOERS SHOULD CONTINUE TO EXERCISE CAUTION DUE TO THE RISK OF RIP CURRENTS AT NORTH AND EAST COAST BEACHES. GENERAL SITUATION: A COLD FRONT IN THE VICINITY OF THE CENTRAL BAHAMAS WILL SLOWLY DRIFT INTO THE SOUTHEAST BAHAMAS WITH HIGH PRESSURE BUILDING IN ITS WAKE. ADVISORY: A SMALL CRAFT CAUTION IS IN EFFECT FOR THE CENTRAL BAHAMAS. WINDS: NORTH TO NORTHEAST AT 15 KNOTS IN THE NORTHWEST BAHAMAS AND NORTHEASTERLY AT 15 TO 20 KNOTS OVER OPEN WATERS IN THE CENTRAL BAHAMAS. SEAS: 3 TO 5 FEET OVER THE OCEAN IN THE NORTHWEST BAHAMAS AND 4 TO 6 FEET OVER THE OCEAN IN THE CENTRAL BAHAMAS. 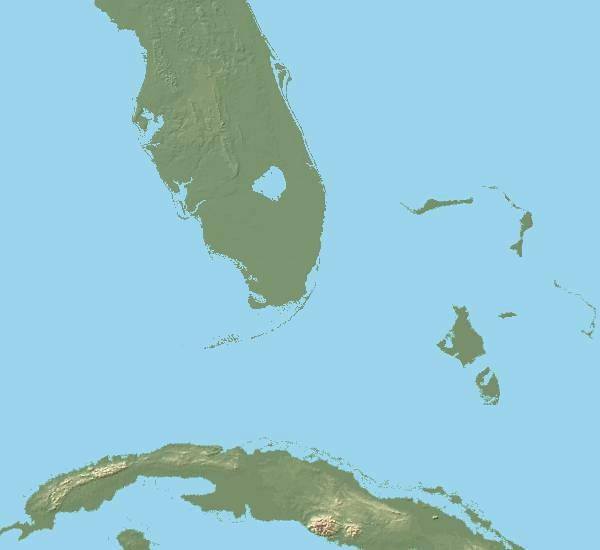 WEATHER: CHANCE OF A FEW ISOLATED SHOWERS ACROSS THE CENTRAL BAHAMAS TODAY. WINDS: NORTHEAST TO EAST AT 10 TO 15 KNOTS OVER OPEN WATERS. LOW TIDE: 3:55PM 4:44AM TUE. EXTENDED FORECAST: THE FRONTAL BOUNDARY WILL DISSIPATE ACROSS THE SOUTHEAST BAHAMAS WITH HIGH PRESSURE MAINTAINING STABLE CONDITIONS OVER THE COUNTRY THROUGH MID WEEK. WINDS: NORTHEASTERLY AT 10 TO 15 KNOTS IN THE NORTHWEST AND CENTRAL BAHAMAS…NORTHEAST TO EAST AT 10 KNOTS OR LESS IN THE SOUTHEAST BAHAMAS. SEAS: 2 TO 4 FEET IN THE NORTHWEST AND CENTRAL BAHAMAS…3 FEET OR LESS IN THE SOUTHEAST BAHAMAS. WINDS: NORTHEAST TO EAST AT 10 KNOTS OR LESS ACROSS ALL AREAS. SEAS: 3 FEET OR LESS ACROSS ALL AREAS. WEATHER: CHANCE OF A STRAY SHOWER. SPECIAL WARNINGS: BEACHGOERS SHOULD CONTINUE TO EXERCISE CAUTION DUE TO THE RISK OF RIP CURRENTS AT NORTH AND EAST COAST BEACHES. WEATHER: MOSTLY SUNNY, WARM AND A BIT BREEZY WITH THE CHANCE OF A FEW ISOLATED SHOWERS ACROSS THE CENTRAL BAHAMAS TODAY. MOSTLY FAIR AND MILD TONIGHT. WEATHER: VARIABLE CLOUDINESS AND WARM WITH A FEW PASSING SHOWERS TODAY THROUGH TONIGHT. WEATHER: MOSTLY SUNNY AND WARM. WEATHER: PARTLY TO MOSTLY SUNNY AND WARM WITH THE CHANCE OF A STRAY SHOWER. No big changes from March's outlook. Scattershot track season, but lower than average activity is expected in the Main Development Region. Surface pressure analogs on Euro indicate a weaker year than our forecast. WeatherBell has been the pioneer in landfall impact ideas and usually I light up the map with areas to look for the greatest activity relative to normal (and also less than normal). As of this writing I think the season is scattershot enough so that I am identifying areas where I think the ACE will see well below normal activity. The rest of the map will be closer to Climatology. Certainly a strong individual track would create a higher ACE value close to where the storm track is. However, I can't draw a conclusion over a large area where we should look for the strongest activity. The water is very warm near our coasts again, and so there is the threat of spin up storms that can come onshore while near their peak. 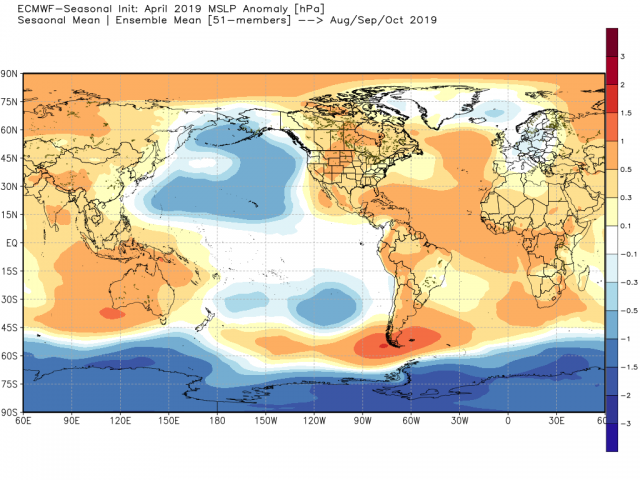 The large area of high pressure over North America for the season is unlike the years, which we have shown on previous outlooks, where storms weakened off their peak. That being said, the Euro pressure forecast is most similar to a blend of years that were near or below the bottom end of our ACE range. 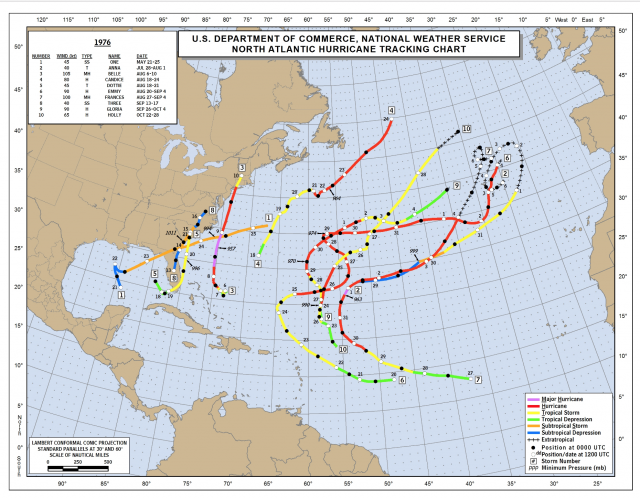 We have increased the major hurricane range to 1-3. 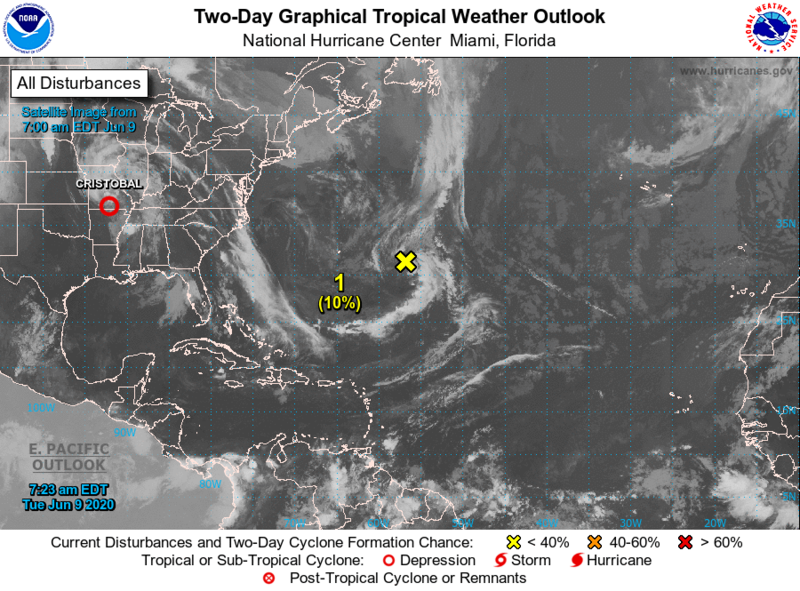 This is because NHC may declare a small storm a major hurricane based on satellite imagery, like it did with Danny a few years ago (a storm less than 100 miles wide that briefly hit Category 3). 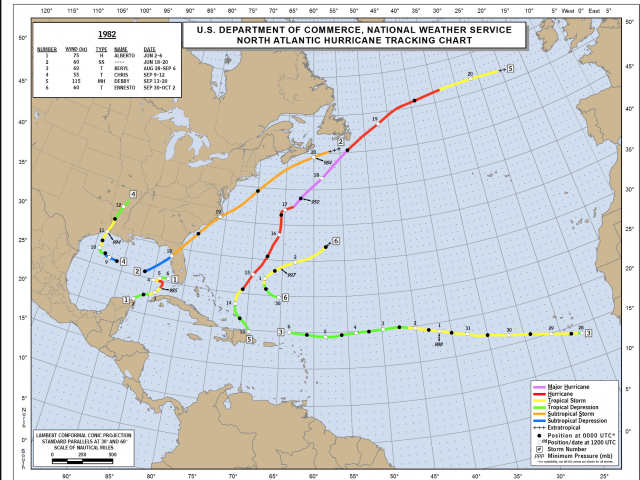 In the pre-satellite era, Danny would not have been a major hurricane unless a ship happened to wander through it or it went directly over a data buoy. This is a not a knock on NHC; they simply tell it like it is and since we can now see things like that we must adjust. That being said, the large area of yellow in the map above across the Main Development Region portrays my belief of a weaker than average year like last year in the deeper Tropics. Keep in mind that 2015 was weaker than average but Joaquin went wild near the northwestern side of where I have the yellow. 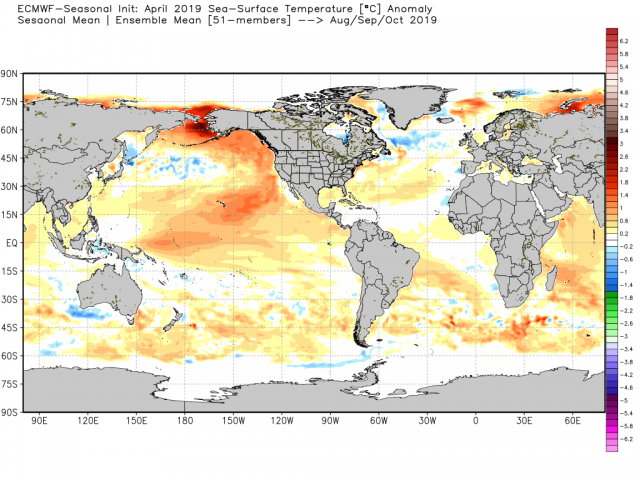 The SST forecast still indicates warmer than average SSTs near the U.S. coast and a diminishing El Niño, but one that is still present. 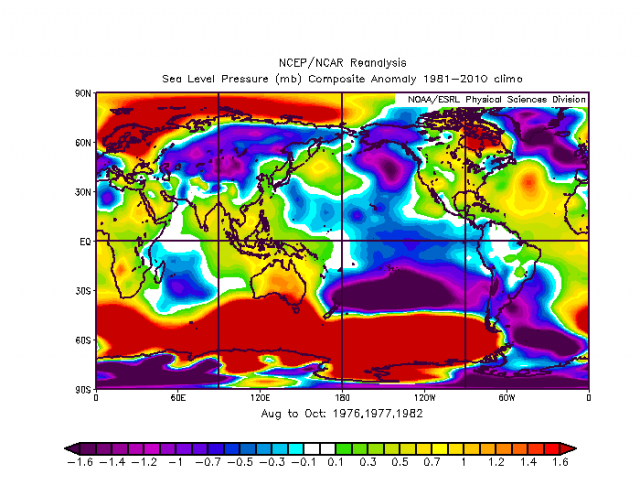 The surface pressure pattern is closest to a blend of 1976, 1977 and 1982. Notice the randomness of these seasons with lack of major development over the Deep Tropics. Belle in 1976 faded coming up the coast, but with the same kind of storm this year over much warmer water it could be a bigger problem. 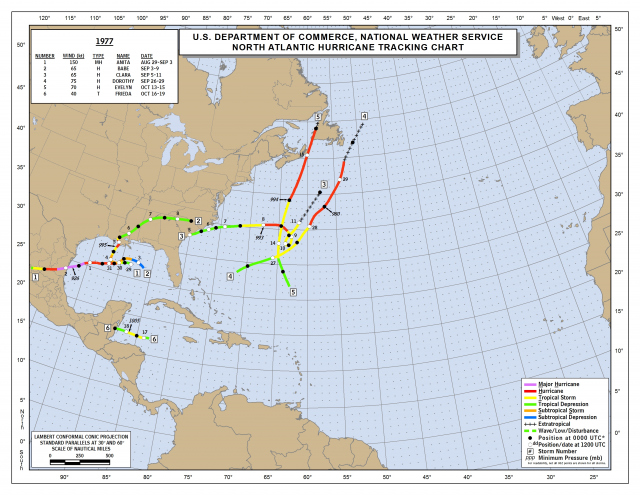 Anita in 1977 in the Gulf of Mexico went to a Category 5 but was driven west-southwestward into Mexico. Still the activity in all those years were below average, with 1977 and 1982 below our lowest limit of the range. However, there is a lot of high, not low pressure, over the U.S. There is a weakness in the pressure pattern in the northwestern Atlantic, making me wonder if the pattern might be conducive there. Overall it is not a very bullish look. From this point of view it looks like a down year in at least the Main Development Region and less of a year farther to the north than last year. The caveat is that in-close systems and warm water feedback will lead to challenges that can make or break the season from an impact perspective. On the high end, if the El Niño isn't impressive we could see activity in line with last year, hence the relatively broad range. I have a feel for where below average intensity of storms relative to normal will be, but the term "scattershot" describes the idea of stronger features away from the Deep Tropics this year.